When current flows in a wire, it creates a magnetic effect around the wire which is called magnetic field. The magnetic field is specified by a direction as well as a magnitude. The following figure shows a magnetic field, of a bar magnet, by field lines that originate from the North Pole and end at the South Pole. The strength of the magnetic field mainly depends upon the value of current and distance from the current carrying conductor. 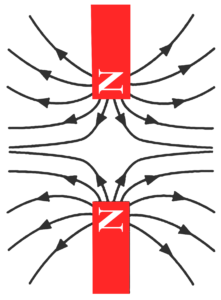 When unlike poles of magnets are placed in close proximity, their lines of force react as indicated in the following figure. Note the attraction between the poles. The opposite effect occurs when like poles are placed close together, as shown in the figure. From these observations, we may conclude that unlike poles attract and like poles repel. The force of attraction or repulsion between magnets varies directly with the product of their strengths and inversely with the square of the distance between them. M1 and M2 are magnetic poles strength and r represent a distance between magnetic poles. The constant term k depends on the medium separating the poles. This dependence is also reflected by the constant which is called absolute permeability. Note that the force equation for magnetic poles has the same form as the Coulomb’s equation for electric charges. Magnetic lines of force are used to represent a magnetic field. Faraday introduced the idea of flux lines to simplify the analysis of magnetic fields. One must remember that the field is continuous and exists between, as well as along, the lines of force. They form closed paths. (They travel from the north to the South Pole outside the material and from the south to the North Pole within the material). They repel earth other (they tend to separate). They tend to take the shortest path. They do not cross one another because of the separation tendency.